Many people probably think it's just a gimmick that we refer to our Cobaya events as "experiments." But we really do push chefs to push themselves. This is not simply an excuse to trot out the same old dishes in a fixed price, tasting menu format. If there's one "rule," it's that it has to be an off-menu experience. What diners may not fully appreciate is that oftentimes, this means they're getting a dish that the chef not only has never served before - sometimes they've never even made it before. And since we're rarely working with chefs who have the opportunity or budget to do a full dry run in advance, often these really are experiments of a sort, and the diners really are the guinea pigs. 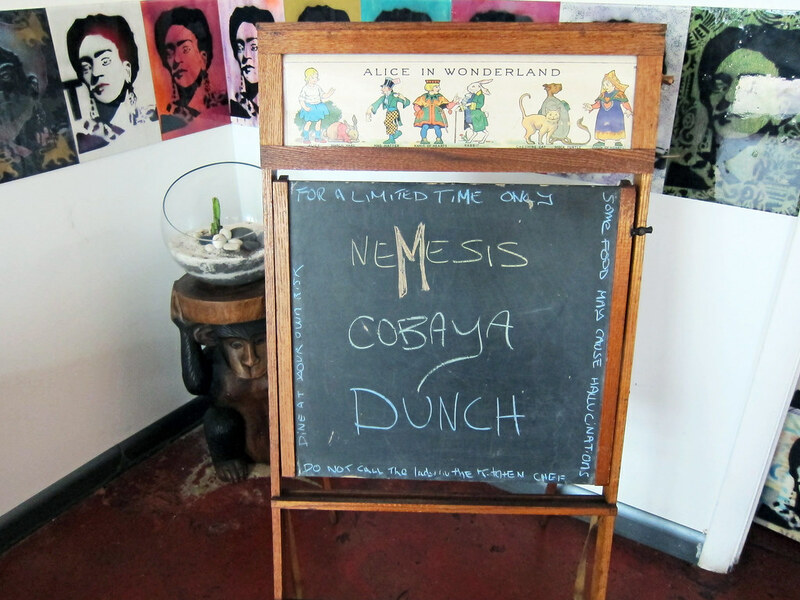 That was undoubtedly the case with our most recent Cobaya event, a late brunch ("Dunch") with Chef Micah Edelstein of neMesis Urban Bistro in downtown Miami. Which, to me, makes the meal she put together all the more remarkable. We wanted to do it on Sunday, when we could take over neMesis' cozy dining room, and that quickly turned to thoughts of brunch. Brunch became "Dunch" (dinner / lunch) when we proposed a noon-ish start time, to which Micah responded "I don't get up before noon on Sunday!" Though we didn't start until 3pm, I suspect she had to rise a little earlier than usual anyway. The menus on the tables were actually the final iteration of sketches Chef Edelstein prepared both to brainstorm dishes and game-plan their preparation, an interesting insight into both the creative and logistical processes of putting together the meal. 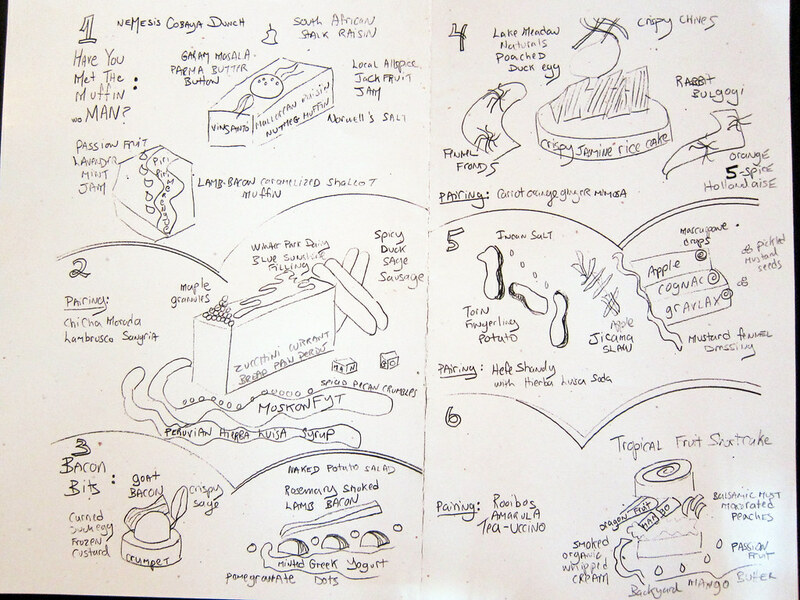 Afterwards, she shared with me some earlier versions, which showed how some dishes changed and evolved, and also how each of the components was highlighted or crossed off as it was prepared. I'll show each course here with both the sketch and the final realization. We periodically devote our attention here to the task of tracing how food ideas and trends migrate their way from restaurant to restaurant. As we noted way back when, sometimes the phenomenon is the result of "homage" or "inspiration;" sometimes it's "copying" or "plagiarizing," the lines between which are not always easily drawn. Every once in a while it may actually be a case of genuinely spontaneous independent creation. Often, what prompts these reveries is the audacity of a chef who claims to have "invented" a dish. Almost invariably, such braggadocio is unwarranted. There is, in fact, very little that is truly new under the sun, and very few culinary creations can legitimately claim to be so completely untethered to what came before as to constitute an "invention." 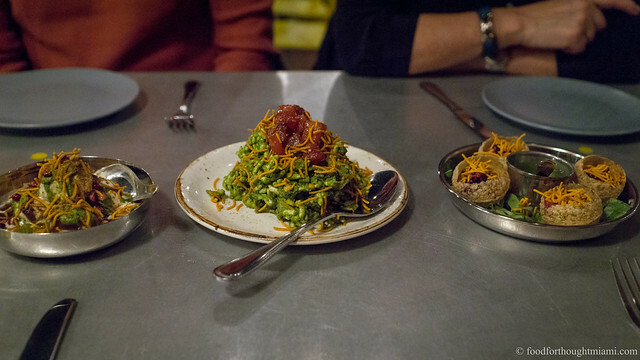 I'll bet I'd really like Chef Alex Raij's food. 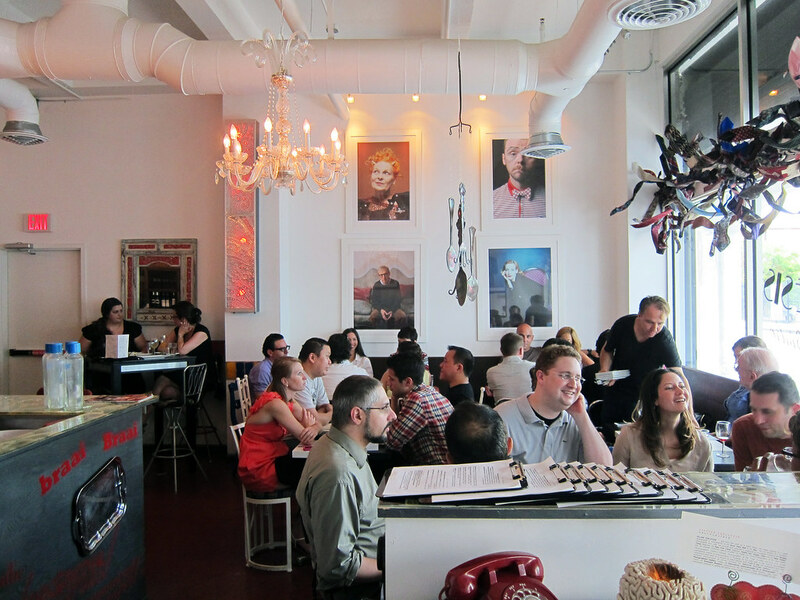 For several years now, she's put together menus of pretty authentically Spanish tapas dishes for New York restaurants, first at Tia Pol, then El Quinto Pino, then plumbed more deeply the depths of Basque cookery with Txikito, and most recently opened La Vara, which explores the even more esoteric Moorish-Jewish-Spanish food connection. I love all that stuff, and by most accounts, she does it very well. You say that before you opened Tia Pol, no one was doing certain things that are now common. No one was doing a current expression of tapas. I wanted to dispense with all the Spanish dishes that were on every menu. No one was doing patatas bravas or shishito peppers. Nobody was making bikini sandwiches or pintxos morunos. No one was eating romesco sauce. I'm resentful, in some ways, but not regretful. What bothers me is when people get called innovative when they've taken someone else's idea. Toro is coming to New York, but he straight-up took the uni panini from us. I know he took it, and he knows he took it. It's one of the few original things I've created in my life. Michelle Bernstein took that Bar Mut dish and then got called a creative genius by Frank Bruni. What bothers me is when people don't credit where they took it from. When we borrow something, we give credit and name the restaurants we love in the menu. Let's take each of those in turn. We've actually been in talks for this Cobaya dinner since last October, before Chef Andrew Carmellini opened his Miami outpost of The Dutch. Of course, Carmellini has had some other stuff on his plate - opening the Miami restaurant, running Locanda Verde and The Dutch in New York, publishing a new cookbook, "American Flavor," to name a few. But the stars finally aligned last week, when Carmellini and his Miami crew, including Chef de Cuisine Conor Hanlon and Pastry Chef Joshua Gripper, put together a fantastic-looking menu for thirty guinea pigs. I say fantastic "looking" because, sadly, I had to miss this one due to work-related travel. But I did stop by before the dinner and Chef Carmellini was gracious enough to give me a tour of the kitchen to see what was in progress. The theme carrying through several of these dishes was "The Whole Damn Thing!" - turbot cooked whole (innards and all, if he stuck with the plan as of around 4pm the afternoon of the dinner), with a sauce made from the bones; a fifty pound pig from Hialeah, prepared about a half-dozen ways. And though I didn't get to taste any of it, I got a good look at what I missed out on from the folks who were there. It's the first Cobaya dinner I've missed, and it sure looks like a great one. It's also my first time trying to recap a meal I didn't eat. Here's Chef Carmellini providing a greeting to the diners, the menu, and below, pictures from some of the folks who were at the dinner. (Video courtesy of Ethan Shapiro, pictures via Chowfather, Allison Riley a/k/a Y'All Taste This, and Andrew Carmellini). My usual descriptive flourishes will be missing - wish I could tell you about it..